We from Cleaners to Hire have been in the cleaning business for a number of years and today we are the favorite sanitation contractors of the local residents and business owners because they know that we focus on their satisfaction. We also give a 110% effort to meet the demands and expectations of our clients because we value the trust that they have in us and the quality of our services. After all it is not by chance that we have become synonymous with punctuality, dependability and perfection. Keep in mind that our sanitation technicians can clean equally well both natural and synthetic materials without ever endangering their pattern, print or cords. We from Cleaners to Hire have invested heavily into the best washing and steam machines because we believe that the better our instruments are; the better results we will be able to achieve. If need our cleaners will take down your window treatment and bring them to our cleaning facility so that they can be washed into our commercial laundry machines. 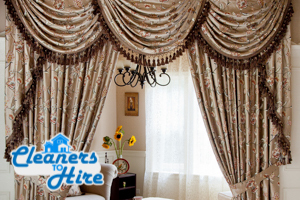 Once, your curtains are clean and stain-free we will bring them back you and of course hang them for you. Our company works only with eco-friendly sanitation products which don’t contain any chemical or toxic ingredients. We have chosen to work with green detergents because they are extremely efficient against resilient stains and spots. Don’t assume wrongfully that we work with expensive prices because we have treatments to be eco-friendly. The truth is that our sanitation rates are affordable and can easily accommodate your budget. Bear in mind that you can entirely delegate to us to maintenance of your window treatments as we provide contract services. 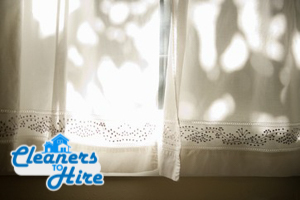 This means that we are ready to come on a periodic basis and sanitize your drapery and blinds for you. The frequency of the routine will be set to suit in full your personal agenda and preferences, and can be adjusted systematically by your request. You can learn more about our contract curtain cleaning by exploring our website or contacting our customer consultants. You can see for yourself that we provide high quality sanitation at very reasonable prices by giving us a call or sending us an e-mail and requesting your free quote anywhere in London. Our quotations are non-binding and final, which means that you won’t be shocked with hidden fees and taxes once we have meticulously cleaned your blinds, drapery and window covers. Once you get in touch with us, don’t be shy to request additional information about the other offers that we provide in all of London and our methods of work.